With a name like Coral Champagne cherries, the fruit already has a leg up in crowd appeal. These cherry trees bear large, sweet fruit heavily and consistently, so it’s not surprising that they are very popular. If you are ready for a new cherry tree in your orchard, you’ll be interested in additional Coral Champagne cherry information. Read on for tips on how to grow Coral Champagne trees in the landscape. Nobody quite knows the exact origin of Coral Champagne cherries. The tree may have been a result of a cross between two selections called Coral and Champagne in UC’s Wolfskill Experimental Orchard. But that is far from certain. What we do know is that the variety has come into its own in the last decade, paired with rootstocks Mazzard and Colt. The cherry ‘Coral Champagne’ variety has gone from being relatively unknown to becoming among the most widely planted varieties in California. The fruit of Coral Champagne cherry trees is exceptionally attractive, with shiny dark flesh and a deep coral exterior. The cherries are sweet, low-acid, firm and large, and rank in the top three varieties of cherries exported from California. In addition to being good for commercial production, the trees are great for home orchards. They are small and compact, making the Coral Champagne cherries easy to pick for kids and adults too. 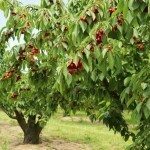 If you are wondering how to grow Coral Champagne cherry trees, you may be happy to know that this variety of cherry requires less chill hours than Bing. For cherries, like Coral Champagne, only 400 chill hours are required. Coral Champagne trees thrive in U.S. Department of Agriculture plant hardiness zones 6 through 8. Like other cherry trees, this variety requires a sunny location and well-drained soil. If you are growing cherry Coral Champagne, you’ll need a second cherry variety nearby as a pollinizer. Either Bing or Brooks works well. The fruit of the Coral Champagne cherry trees ripens in mid-season, toward the end of May.